Mumbai: With the sale of stricken national carrier finally finding wings, the focus will now be on its precious slots, bilateral flying rights as well as its large fleet of wide bodied and narrow bodied aircraft and the 23 million passengers it carries every year. In the last few months, the country’s largest domestic carrier IndiGo, run by InterGlobe Aviation Ltd, and Tata Sons Ltd have shown interest in acquiring a controlling stake in Air India though the former had shown interest only in its international operations. Media reports have also named the Naresh Goyal-led Jet Airways (India) Ltd, and Qatar Airways Ltd as potential suitors for Air India’s airline business, as well as the Tata Sons and Singapore Airline joint venture Vistara. That apart, Turkey’s Celebi Aviation Holding, Bird Group, Menzies Aviation Plc and Livewel Aviation Services Pvt. Ltd have shown interest in acquiring the national carrier’s subsidiaries. “Air India’s international slots, bilateral rights and other assets will enable its acquirer to fly on lucrative (international) routes," said Subrata Ray, senior group vice president, Icra. Domestic market leaders IndiGo, which had 39.8% of the domestic market share during February, can be the runaway leader by acquiring Air India which had a 13.8% share of the domestic market in February. “IndiGo will benefit immensely if the company is to buy the international operations of Air India as some of the slots held by the national carrier are otherwise very difficult to obtain," said an industry expert who didn’t want to be named. “IndiGo can become a major brand for Indians to fly international if the company can pull off buying Air India," the person added. The Naresh Goyal-led Jet Airways, which currently has about 16.8% of the domestic market share could close down IndiGo’s lead in the domestic segment by acquiring Air India. Jet Airways can also become a destination airline internationally by acquiring Air India rather than a feeder airline which feeds passengers through its gateways in the Middle East and Europe, said the person mentioned above. “It (private player) will be able to leverage Air India’s slots, fleet and highly trained staff better. By building on Air India’s 17 and 13% market share, respectively in the international and domestic routes, the winning bidder will become a far more formidable force," said Amber Dubey, partner and India head of aerospace and defence at global consultancy KPMG. 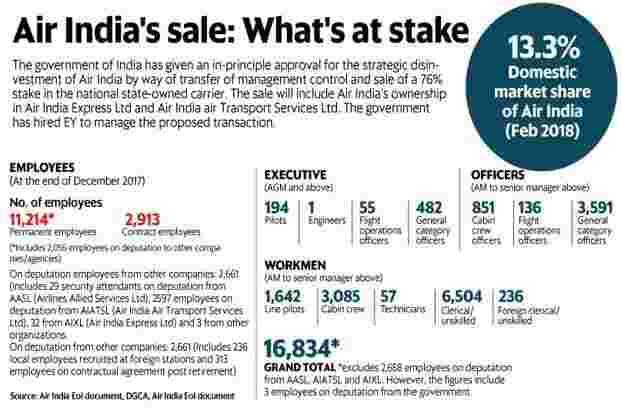 “All this has to be balanced against past liabilities, personnel issues, operational freedom and other legacy challenges associated with Air India," Dubey added. A sticky point for a potential buyer is the huge amount of debt accumulated by the airline, estimated at over Rs53,000 crore. The government plans to transfer about Rs33,000 crore from the total debt of the airline into a special purpose vehicle (SPV). The remaining debt, which is against aircraft purchases, will remain on its books. Air India currently has 115 aircraft in its fleet including 46 wide bodied and 69 narrow bodied offerings from Boeing and Airbus. The airline connects 54 domestic destinations, comprising of 2,330 weekly departures, and 39 international destinations, including major cities in the US, Europe, the Middle East, Australia and other geographies. “The privatisation of Air India will ensure that the industry will run in a rational way. The private player, unlike the government, will bring about a rational spending, funding and capital infusion in Air India, which was not the case earlier and affected the industry as a whole," added Icra’s Ray.